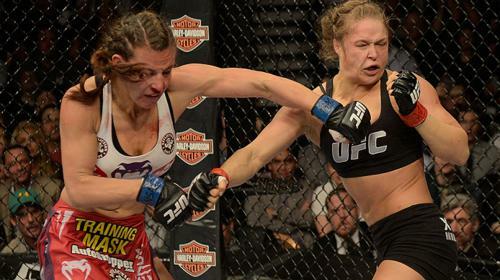 Check out the best of Ronda Rousey! Breaking Ground: Ronda Rousey Nov 4, 2013 (40:28) Ronda Rousey: Breaking Ground examines the remarkable rise of the first female champion in UFC history. Fueled by the death of her father and the discipline of her mother, Ronda has broken down barriers and emerged as a pioneer and a role model. 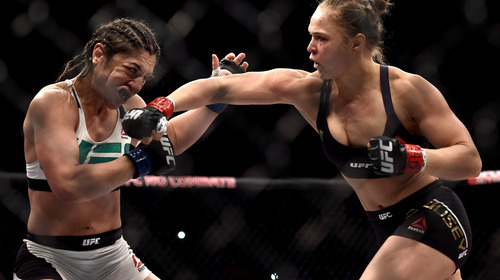 Ronda Rousey vs Bethe Correia UFC 190 Aug 1, 2015 (18:07) Named the most dominant athlete on the planet, undefeated UFC® women’s bantamweight champion and former U.S. Olympic medalist Ronda Rousey went head-to-head with surging contender No. 7 Bethe Correia. 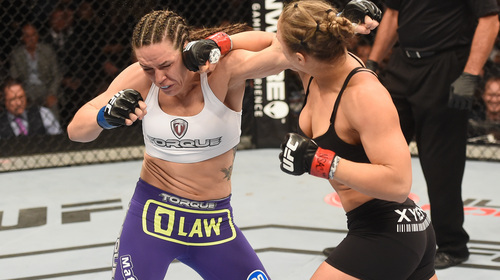 Ronda Rousey vs Cat Zingano UFC 184 Feb 28, 2015 (10:18) Many said that Cat Zingano would be Ronda Rousey's toughest test yet, but the women's bantamweight champion had made quick work of her last few opponents and was looking to do the same when she met Zingano in the Octagon. Ronda Rousey vs. Alexis Davis UFC 175 Jul 5, 2014 (14:31) UFC women's bantamweight champion Ronda Rousey attempted to successfully defend her title for the third time when she faced top contender Alexis Davis. Ronda Rousey vs. Sara McMann UFC 170 Feb 22, 2014 (16:35) Two former U.S. Olympians met when judo bronze medalist Ronda Rousey defended her UFC women’s bantamweight title against freestyle wrestling silver medalist Sara McMann. 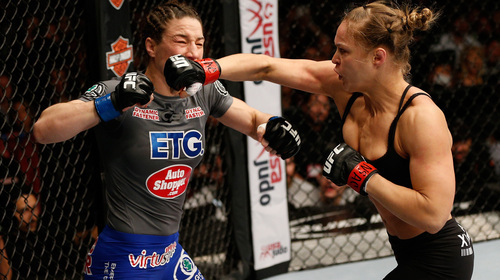 Ronda Rousey vs. Miesha Tate UFC 168 Dec 28, 2013 (29:11) A season of coaching teams on TUF 18 caused the rivalry between Ronda Rousey and Miesha Tate to amplify. 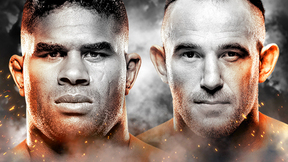 At UFC 168, the two women would battle not only for the bantamweight title, but for the ultimate bragging rights in a historic feud. Ronda Rousey vs. Liz Carmouche UFC 157 Feb 23, 2013 (21:27) In this first ever UFC Women's Bantamweight Championship fight, Strikeforce champ and Olympian judoka Ronda Rousey took on San Diego native and United States Marine Liz Carmouche. Ronda Rousey vs. Sara D'Alelio Strikeforce Challengers 18 Aug 12, 2011 (5:56) The first US woman to medal in the Olympics in judo, "Rowdy" Ronda Rousey owned back-to-back armbar wins to kick off her MMA career. 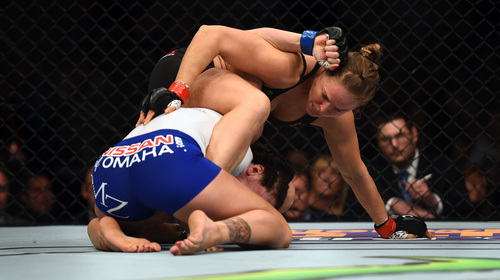 In her dueling Strikeforce debut, Rousey faced grappling ace Sarah "The Monster" D'Alelio, who possessed a 4-1 pro record. Ronda Rousey vs. Autumn Richardson Tuff-N-Uff Nov 12, 2010 (8:11) In her second amateur fight, superstar in the making Ronda Rousey collided with the vastly more experienced Autumn Richardson in the Tuff-N-Uff ring at the Orleans in Las Vegas. Ronda Rousey vs. Taylor Stratford Tuff-N-Uff Jan 7, 2011 (7:58) In her third and final amateur fight, Ronda Rousey took on fellow hot prospect Taylor Stratford in the Tuff-N-Uff ring at the Orleans, Las Vegas.